The NSB Group has delivered good results in a year that has been marked by significant restructuring through demerger of parts of the operations, preparation for tender for passenger traffic and a changed role due to the railway reform. The key figures in the following points are compared with similar activities in 2016. The parent company, NSB AS, showed a profit after tax for the year amounting to NOK 502 million (NOK 185 million). Group contributions and dividends from subsidiaries amounting to NOK 45 million (NOK 561 million) are included in the annual profit for the parent company. The operating profit for the parent company amounted to NOK 371 million (NOK 436 million). The change in operating profit is mainly due to increased costs for lease and maintenance of trains. Net cash flow from operating activities amounted to NOK 572 million (NOK 2,698 million). Net cash flow invested was NOK 708 million (NOK 1,016 million). This includes NOK 148 million (NOK 1,471 million) in purchases of fixed assets. These investments focused primarily on increasing capacity and profitability within the Group’s business segments. No dividend was paid to the company’s owner in 2017. After this year’s profit, total equity for the parent company amounted to NOK 4,113 million (NOK 6,464 million). The main reason for the reduction is the demerger of operations due to the railway reform. The equity ratios is of 51 % (42.7 %). After implementation on 1 January 2018 of the change in lease obligations in IFRS 16, the equity ratio of the parent company NSB AS will decrease to 29.2% before deduction of dividend distribution for the 2017 income year. The parent company’s retained earnings amounted to NOK 428 million. For the NSB Group, total equity amounted to NOK 4,985 million (NOK 9,934 million), giving an equity ratio of 43.6 % (34.3 %). Following the implementation on 1 January 2018 of the change regarding lease obligations in IFRS 16, the equity ratio of the NSB Group drops to 26.5% before deduction of dividend distribution for the 2017 income year. Group return on equity is 13.2 % (12.1 %). The Group working capital amounted to 4,911 MNOK (4,219 MNOK), a change of 692 MNOK. The accounts have been submitted on the assumption of the continuing operation of the company, and the Board confirms that this is the case. Passenger train operations are run by NSB AS and its subsidiaries NSB Gjøvikbanen AS and Svenska Tågkompaniet AB. The ownership of Norske Tog AS and Entur AS, which were established in 2016 as a result of the Norwegian railway reform in order to safeguard the ownership of passenger rolling stock and ownership and operations of sales and ticketing systems, was at the beginning of 2017 transferred to the Ministry of Transport and Communications. The legal processes were finalized 24th of April 2017. As a part of the railway reform, the Norwegian government has announced three tenders relating to passenger rail services; service packages South, North and Vest, with operations commencing in June/July 2019, December 2019 and December 2020. In addition, further tenders are planned, for example for the central eastern Norway area. The passenger train operations has implemented a change programme to prepare for such tenders. Organisation and staffing will both have to be adapted to the new situation in the Norwegian market. During 2017 the number of new Flirt-trains in operation has increased to 91 (81), of which 4 are being phased in at Gjøvikbanen as replacement for older train sets. During 2017 the capacity in seat kilometers has increased by 5 %, by the start of 4 express services at Vestfoldbanen, and the use of more double sets in the local train service south and north of Oslo. For NSB AS and NSB Gjøvikbanen AS, at the end of December 2017, it was decided to close the current pension scheme in SPK for those over 55 years by the end of 2018. All younger employees at the time of the closing date will receive a registered right in SPK and from 2019 a new defined contribution pension scheme. Pension cost for 2017 and commitment as of 31 December 2017 is calculated for these companies in accordance with the principles in IAS 19. The pension commitments for these companies amounting to MNOK 1 560 are considered to provide a true and fair expression of the companies’ obligations taking into account the estimated effect of liquidation of the scheme. Operating revenue from the passenger train operations in 2017 was NOK 7,966 million (NOK 7,880 million), an increase of 1.1 %. The total no. of journeys in Norway and Sweden was 70 million, an increase of 4 %. For the passenger train operations in NSB AS the increase was 6.3 %. 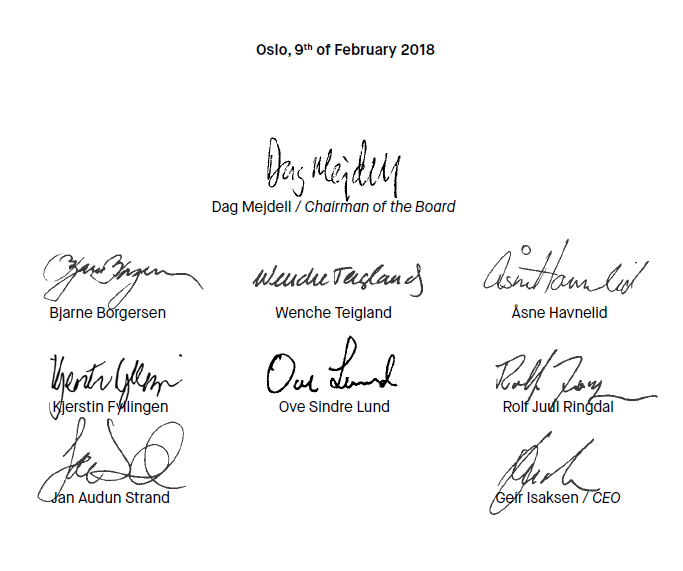 The operating profit was NOK 558 million (NOK 398 million), an increase of NOK 160 million from 2016, mainly due to increased profit from joint ventures and associates and profit from the sale of shares in Oslo S Parkering AS. The increase in revenue was offset by increased costs for the hire and maintenance of trains and use of sales and ticketing systems.The Swedish operations has an operating profit of NOK – 52 million (NOK 4 million), a reduction mainly due to a change in tenders operated. An efficiency program is planned and under implementation. Passenger train operations in Norway achieved a punctuality of 88.4 %, which is at about the same level as 2016, but under the official target of 90 %. The bus operation is run by Nettbuss AS which has 28 subsidiaries and 7 associated companies. The Nettbuss Group operates in almost all counties in Southern and Central Norway. Most of the operations of the Swedish subgroup are in the south west of Sweden. Both in Norway and in Sweden, bus services are mainly under contract to regional authorities, but the Group also offers express bus services, tourist services and workshop maintenance. The operating profit amounted to NOK 264 million (NOK 306 million). Total operating revenue for 2017 amounted to NOK 6,075 million (NOK 5,850 million), an increase of 3.8 % from the previous year. The change in operating revenue is mainly due to changes in tender traffic in 2017. The bus operation has participated in relatively few but important tenders over the past year. In 2017 the bus operation was awarded contracts commencing 2018 (Nordhordland and Nord Trøndelag) with 107 busses and a total contract value of NOK 1,100 million, and a contract commencing 2019 (Trondheim) with150 busses and a total contract value of NOK 3,500 million. At the same time tenders for bus services in Kristiansand and Hadeland were lost, and will be discontinued in the summer of 2018. The Swedish part of the business has maintained stable production in 2017 and does not expect major changes in 2018, but in the beginning of 2018, significant production will be put out for tender. The bus operations transported a total of 122 (119) million passengers in 2017 as part of scheduled and express services, and drove 175 (172) million kilometres. Freight train operations are run by CargoNet AS with subsidiaries. The largest part of the business uses shuttle trains for transportation of containers and other intermodal platforms, and terminal operations related to this. CargoNet also operates dedicated services for specific customers for transporting for instance aviation fuel, ore and timber. The freight train operations has in 2017 been characterized by high punctuality and less affected by infrastructure instability than previous years, with the exception of an increase in the autumn associated with storm and flooding. All in all, this helps to improve the standing of rail transport among our customers. Operating revenue amounted to NOK 1,027 million (NOK 980 million), and operating profit NOK – 49 million (NOK – 2 million). The market is characterized by increased competition as the largest freight train competitor was established in the market in mid-2016, has increased its transport offer. The introduction of track access charges has also adversely affected the competitive power compared to road transport. This has resulted in pressure on prices and lower filling rates in the trains, while there are increased costs for rent and maintenance of locomotives and other rolling stock. The extent of unplanned stops due to infrastructure at 103, is higher than last year (50), mainly due to storms and flooding a short period this autumn. Punctuality was 95 % (94 %) measured as delivery within 15 minutes, better than the 90 % target. The tourism operations sells fjord, mountain and cultural experiences to Norwegian customers, tourists and international tour operators. The main parts of the activity is operated through the partly owned companies Flåm Utvikling and Fjord Tours. Work is in process to develop more attractive travel packages by train, bus and boat, together with local tourism actors, which will be available through a digital tourism portal. The Board of Directors has discussed and approved the statement regarding Corporate Governance that is included in the annual report. NSB is one of Norway’s largest transport groups. The parent company, NSB AS, is owned by the State of Norway, represented by the Ministry of Transport and Communications. The Group’s headquarters is in Oslo, while operations are situated throughout most of Norway and parts of Sweden. The change in activities related to the railway reform also has the consequence that the Group’s goals and strategies need to be adjusted. The NSB Group has therefore prepared a new group strategy; The best journey. The four journeys can be understood in two ways. Specifically, the four journeys mean that we promise our customers a simple and comfortable journey from door to door, a climate-friendly and sustainable journey, a safe journey where we take care of the customer and a profitable journey that provides quality and value for money. At the same time, the four journeys means that the NSB Group aims at developing the company so that we offer the best journey for the customer. The four trips are the framework for strategic development, and are leading our work in the coming years. Our goal is to have the most satisfied customers in the industry, that we are better than the competitors to take social responsibility, that we will be Nordic industry leader in traffic safety and HSE, have economic growth, and a return on capital that meets the requirements of the owner. The NSB Group has adopted its own framework for internal control and has established internal control systems that include values, ethical guidelines and corporate social responsibility, organisation, authorisation structure and governing documents. The Board of Directors reviews the Group’s business concept, values, strategies and plans on an annual basis. Risk analyses are performed annually for the Group as a whole, as well as for each business area. Risk pertaining to financial reporting is evaluated through separate risk analyses of specific areas and periodic follow-up meetings with the business areas. The internal control system is revised according to the above strategies and evaluations, resulting in revision of management documents, recommendations, procedures and key controls. The Group’s activities expose the Group to a variety of financial risks: market risk (currency exchange risk, interest rate risk and other price risks), credit risk and liquidity risk. The Group’s overall risk management programme focuses on the unpredictability of the financial markets and seeks to minimise potential adverse effects on the Group’s financial performance. The Group can utilize financial derivativesto reduce certain risk exposures. The Group’s financial risk management is described further in note 15 to the accounts. NSB borrows money in the markets and currencies that offer the most favourable terms overall. Borrowings in foreign currencies are converted to Norwegian kroner through currency swap agreements. NSB aims to minimise currency exchange risk in its financial management. NSB has some exposure to currency exchange risk in its daily operations related to cash and cash equivalents in connection with operations abroad, but otherwise the Group has little exposure to currency exchange risk as most of its income and expenses are in NOK. In the case of agreements entailing a considerable outlay in foreign currency, the currency exchange risk is covered almost entirely for the term of the agreement. As a consequence of the railway reform, NSB’s bond debt has been settled, but the principles above will be applied in the case of future funding. Surplus liquidity is invested in bank accounts, short-term Norwegian bonds and certificates, as well as in bond and money market funds. Changes in interest rates may affect the value of the investments in interest-bearing securities, but these are normally held until maturity. Limits to credit exposure within certain sectors and institutions are established on the basis of credit assessments. Current guidelines state that funding needs during the next twelve months must be covered by means of excess liquidity and committed credit facilities. The Group aims to have free liquidity of at least NOK 500 million. NSB will continue to focus on counterparty risk in financial transactions and has established a framework for exposure and regular follow-up of credit quality on individual counterparties. A minimum A- rating from Standard & Poor’s (or equivalent from another recognized rating agency) is required for the conclusion of agreements relating to financial derivatives. Operational risks are analysed systematically, for example for traffic safety and the achievement of financial targets. An overall risk analysis is prepared for the Group in connection with the annual planning and budgeting process, and both potential negative and positive effects are identified and actions introduced to manage the risk level. The analysis comprises both assessments of the competitive and market situation, the consequences of environmental requirements, climate change and changes in the regulatory framework. Based on the risk analyses, measures and control activities have been established which reduce identified risks, including automatic controls, audits and follow-up, and extended analyses of specific risk areas. The Board of Directors is committed to ensuring that the company maintains corporate social responsibility, and guidelines have been adopted for exercising this. The Group’s biggest contribution to society is to make sure that the transport challenges of society are conducted in an efficient, accessible, safe and environmentally friendly manner. The NSB Group’s new strategy for the green and safe journey will be the guide for how the company works with corporate social responsibility. The goal of the green journey is that we are better than the competitors on sustainability, and this will be measured through climate and reputation assessments. Important measures are to reduce the Group’s emission of green house gases, and use of quality standards and certification as a basis for our environmental work. The goal of the safe journey is that we shall bet the industry leader in traffic safety and HSE, and goal achievement must be assessed on absence due to illness, work injuries which lead to absence and employee satisfaction. Key areas of action are safe transportation for people and goods, a safe journey that is predictable on time and quality, with safe handling of personal data and a safe workplace for our employees. The market for passenger and freight transport is facing major changes over the next few years. Customers make new demands for smart and environmentally friendly solutions, and new technology makes it possible. To succeed in the future, the NSB Group must respond to the customer’s growing expectations. To improve coordination of the Group’s total resources, we will combine the resources that currently work with innovation and business development to develop and offer seamless transport to the customers. The NSB Group will focus on new technology, green solutions, and an offer to the customer that is flexible and tailored to the customer’s needs. The goal is to offer the customer the best journey from door to door. In the short term, the NSB Group has to adapt to a new market situation where all passenger routes in Norway are to be put out to tender. Therefore, a change program is being implemented that will contribute to a strong and viable NSB Group with a lower cost base and thereby more competitive power. In order to ensure that the Group wins the future tenders, the Kompass improvement program is implemented. The freight train operations is implementing the Flyt improvement program to improve and digitize work processes, thereby improving competitiveness. The board is concerned about the low punctuality of passenger traffic, a development that deteriorated in the second half of 2017. NSB is committed to reducing operational deviations that NSB itself may influence and is committed to closer cooperation with BaneNOR on measures to reduce operating deviations due to infrastructure failures. The passenger train operations is negotiating a new public purchase agreement with the State to run passenger services until these are put out to tender. In 2018 the production will be at the same level as in 2017, but with improvements on the Vestfold line where the opening of the Eidanger line will provide a better offer to the Grenland region with travel time savings to Porsgunn and Skien of 20-25 minutes. New trains will gradually be phased in on Gjøvikbanen and then Vossebanen. For 2018 the total capacity increase will be just over 3%. The bus operations continues its efforts to improve the framework conditions in the industry, including working for a better environment, increased road safety and customer-friendly solutions. There are especially three factors that will be important in the future; An offensive focus on public transport solutions that ensures good accessibility for the bus, developing a tender regime that ensures adequate margins to maintain and develop customer-oriented offers, as well as ensuring good and efficient operation in all parts of the business. The bus operations have an ambition to strengthen market share in Norway and increase this significantly in Sweden. By 2018, there will be several tenders related to existing production. This applies to Romerike in the Ruter area and Gjøvik, in addition, tenders comprising more than 700 buses related to lines we do not operate today. In Sweden, tenders of about 1,000 buses will be put out annually for the next 3 years. The competitive situation for rail freight is very demanding. Continued strong competition is expected from both road and other railway companies. The introduction of track access fees have further reduced the competitiveness compared to road transport. In the freight operations, efforts are being made to reduce the negative effects of the introduction of these fees, and to reinforce the efficiency measures in order to adapt the business to current market conditions. However, in order to ensure economically sustainable freight transport by rail, it is necessary to reverse the negative development in competitiveness for rail transport. 2017 has been characterized by the restructuring of the group, and the establishment and implementation of a new strategy. At the same time, the Group’s businesses have managed to maintain good and profitable daily operations, and employee satisfaction has increased. The NSB Group still has good results in external reputation surveys and measurements of customer satisfaction. 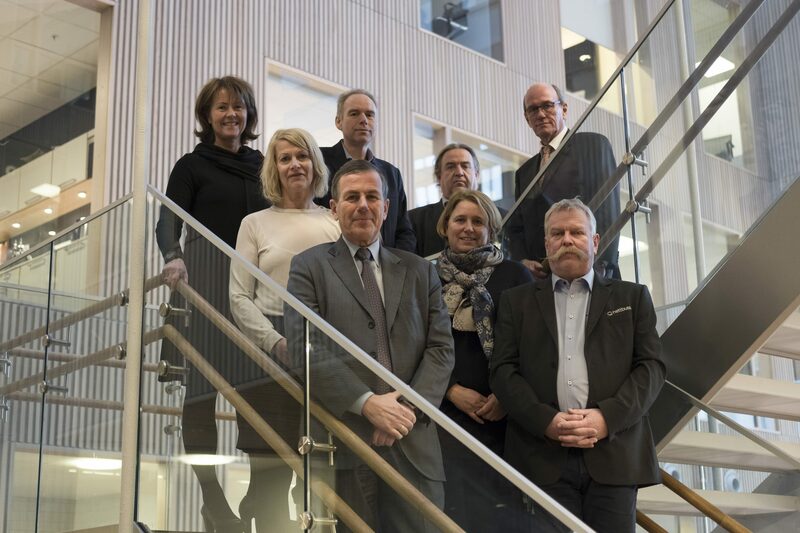 The Board thanks all employees for good efforts this year and looks forward to a joint effort for the further development of the new NSB Group.